This exceptional horse farm is waiting for you! If you’ve been longing for the chance to enjoy your passion for raising horses and other livestock, and live in a home in a peaceful rural setting with endless country views, here is the perfect property for you. 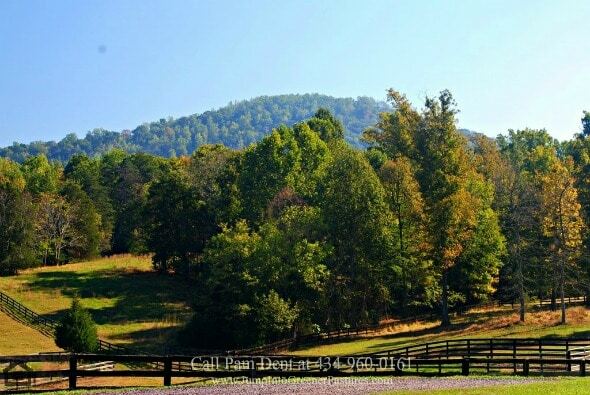 Nestled in Madison County, this 44 acre private Central Virginia equestrian property for sale is what you are looking for. It features gently rolling land with fenced pastures and paddocks, multiple barns, numerous run-ins and 20 stalls. The home itself is a stunner, perfect for both comfortable living, entertainment and relaxation. It offers 4 bedrooms, 3.5 bathrooms, and a spacious 3,000+ square feet of living space. There’s also a large and sunny living room, a cozy den, a modern kitchen, a charming sun room, a spacious master bedroom with attached bathroom, and a beautiful terrace level apartment. Make this horse farm yours for $1,325,000. Call me, Pam Dent at (434)960-0161 to set a schedule for a showing. Make this stunning turn-key horse farm your country hideaway! When you long for a simpler life away from the frantic demands of the city, you’ll find this property on Cook Mountain Drive perfect for your needs. On this property, you can enjoy your passion for raising horses and other livestock, and live in a home in a peaceful rural setting with endless country views. The home is nestled on 44 acres of private land. It is a two-story Federal Style country home featuring 4 bedrooms, 3.5 bathrooms, and a spacious 3,000+ square feet of living space. It is the perfect haven, offering the best of comforts and convenience. This Central Virginia equestrian property is located in Madison County, a beautiful area of gently rolling hills and lush agricultural land. It is a place steeped in history and architectural heritage. From this property, schools, shopping, and dining options are under a 15-minute drive, due to this property’s proximity to highway access. This Madison County horse farm features 44 private acres of lush land, mainly in board fenced and cross fenced pasture. It has everything you need with its multiple barns, many stalls and fenced pastures. The stallion barn is well-constructed with four entrances in a cross aisle design, which gives better ventilation. It has six stalls, a wash stall, a grain room, washer dryer, a tack room, and a break room with baths and shower, which is also the manager’s apartment. This barn has a wood tongue and groove interior finish with imported wrought iron stall fronts and brass ball decoration. The indoor arena structure currently contains six portable stalls which can be removed so it can be made back into an arena. The hay barn is large and can fit 800 bales and has a run-in underneath. The completely rebuilt smaller barn has two large foaling stalls and four pony stalls. There is also a two bedroom Oakwood trailer which could be used as separate living quarter for the workers. Though primarily designed for horses, you can also raise llamas, alpacas or cattle on this vast property. The home itself is a stunner, perfect for both comfortable living, entertainment and relaxation. Enter through its beautiful front door and be welcomed by a good sized foyer and gleaming wood floors which extend throughout the main level. To the right of the foyer is a bright and sunny living room, with large multi-pane windows. Entertaining is easy in this spacious room, which can fit large couches, ample furniture and wall decor with no concern at all. The neutral toned walls complement the warmth radiating from the polished floor, giving this room a welcoming appeal. If you love having guests over, this room is a wonderful place to meet and enjoy your company. To the left of the foyer is the cozy den, where the family can gather and have fun. Large windows give this space a light and airy vibe, while the wood floors lend warmth. This family room features a fireplace with wood surround and mantle, enhancing the inviting feel of this great room. Light it up on cold nights and let its warmth hug you, providing immense comfort. Furnish this space with a comfortable sofa, side table and lamp, and your family photos on the wall, and soon you’ll have a comfortable and cozy spot where you can relax with your loved ones. Off the den is a home office, so you can work in peace and quiet. You’ll surely love the kitchen of this Virginia equestrian estate. It is both elegant and functional, and features beautiful cabinetry, stainless steel appliances, granite countertops and ceramic tile floor. Your kitchen items will find a new home in any of its numerous storage spaces. Fill this home with the aroma of tasty home cooked meals, flavored with love and care. When you want a full view of the charming country scenes around you, retreat to the sun porch. It features ceramic tile floors, and massive walls of glass windows allowing you unhindered views of the greenery laid outside this home. This room can easily turn out to be your favorite gathering spot three seasons of the year. There is no better peaceful spot to enjoy your morning coffee than in this room, standing by one of the oversized glass windows, watching the light spread through the outdoors. A glass door provides access to the outdoors, so you can take a brisk morning walk to fully wake you up. Up on the second floor is a hall which you can turn into a mini-library where the whole family can put their favorite books. Set up a corner as a reading nook and read your favorite books in peace. This home has 4 bright and well-appointed bedrooms. Turn the master bedroom into your private sanctuary, where you can rest and relax after a long day of work. Carpeted floors enhance the inviting feel of this bedroom, and the large windows provide natural light and lend warmth and charm. You will look forward to the inviting and homey feel of the master bedroom. A walk-in closet is available for your clothes and other personal items. There is also an attached bath with a large walk-in shower. Downstairs in the basement is another living space. The terrace level apartment is homey and inviting. It offers an open floor plan and a private entrance, as well as connecting with the home. The living room is large, with neutral toned walls, recessed lighting and a cozy fireplace. The kitchen is complete with a breakfast area, granite countertops, and plenty of storage space. One of the best things about living in the country is the gorgeous views that await you each time you step out of the home. This Madison County horse farm has a vast backyard bordered with mature trees. It is a spectacular sight, especially during the fall season. This country home offers you a chance to experience the Virginia country life, experience nature and indulge in your love for horses. Take advantage of this opportunity and the property can be yours for $1,325,000. If you want to know more about this land or look at similar properties in the area, visit my website at http://JumpIntoGreenerPastures.com. Call me, Pam Dent, at (434) 960-0161. Horse farms here in Central Virginia are my specialty. Let me help you find the property which will best fit your budget and lifestyle.